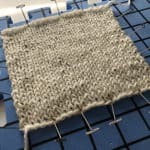 Editor’s note: Read the note at the bottom for a way that can be used in both knitting and crochet. There are different ways to add beads to your project. One method is to string the beads on the yarn before beginning to crochet and pull each bead into place when needed (or break the yarn and string them at the section that needs beading). 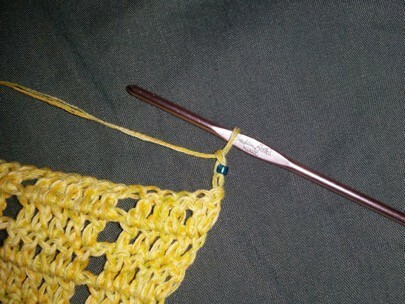 A second method is to use a tiny crochet hook and pull a loop of yarn through each bead as needed. 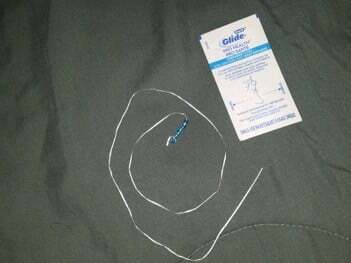 My favorite method is to use a piece of dental floss called a Threader (I bought mine in WalMart – it was in the same aisle as the toothpaste and mouthwash). 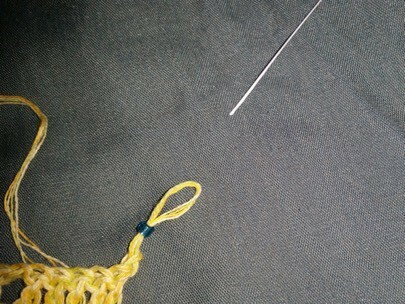 After taking the Threader out of the package, cut off the tip of the stiff end (there is usually a tiny bit that is not stiff – that end will become your needle). 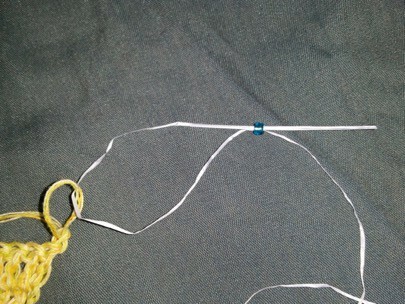 Thread one bead, move it down to the end of the floss and tie a knot around it. 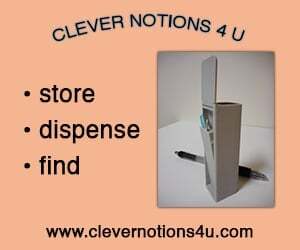 Put a small amount of beads on the floss – too many will be heavy and awkward and easily dropped (ask me how I know!). 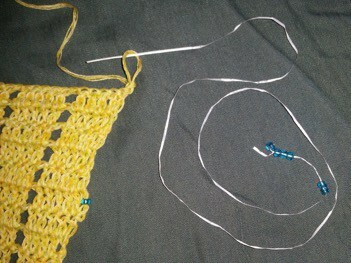 Take the hook out of the loop of the stitch where the bead will go. Insert the stiff tip of the Threader into the loop. 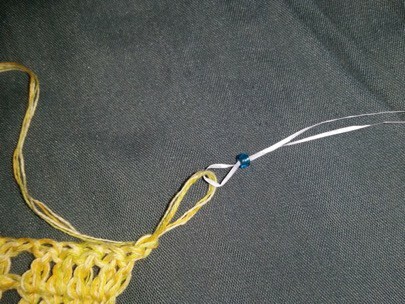 Slide one bead up towards the stitch. Insert the stiff end of the Threader back through the bead. The crochet stitch and floss are linked together at this point. 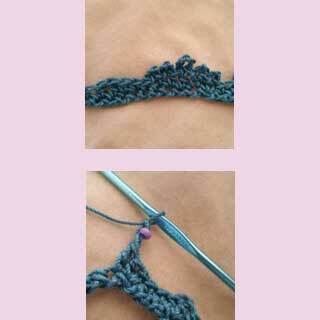 Slide the bead down towards the crochet stitch. 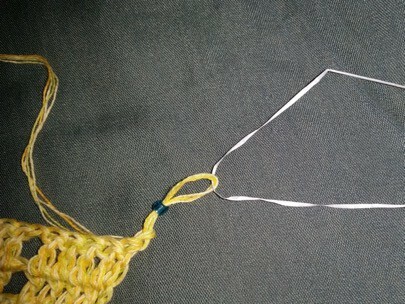 Continue moving the bead down the floss and onto the loop of the crochet stitch. 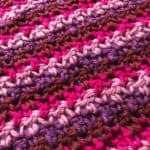 Remove the floss from the loop of the crochet stitch. 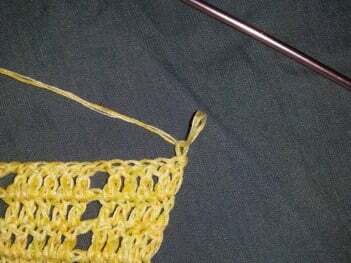 Insert the hook back into the loop of the crochet stitch. 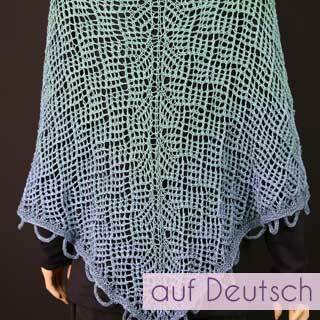 Continue with the next crochet stitch in the pattern (in this example the next stitch in the pattern is a chain stitch). 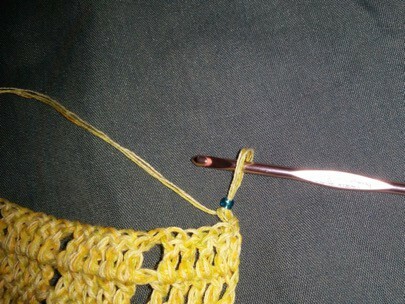 The Threader can also be used to transfer beads directly onto the yarn using a similar method. 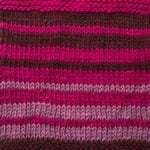 When adding beads to the yarn, you do not need to move one bead at a time. 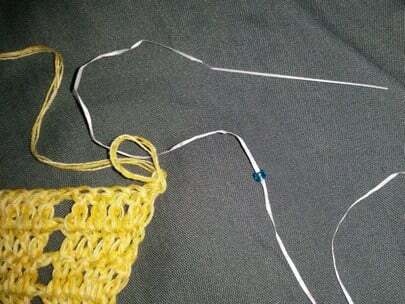 Instead of working onto a loop of a crochet stitch, you’ll make a loop with the yarn: insert the stiff end of the Threader through the loop, slide the bead(s) towards the loop, insert the stiff end of the Threader back through the bead(s), slide the bead(s) down the floss and onto the loop of the yarn, remove the floss from the loop.